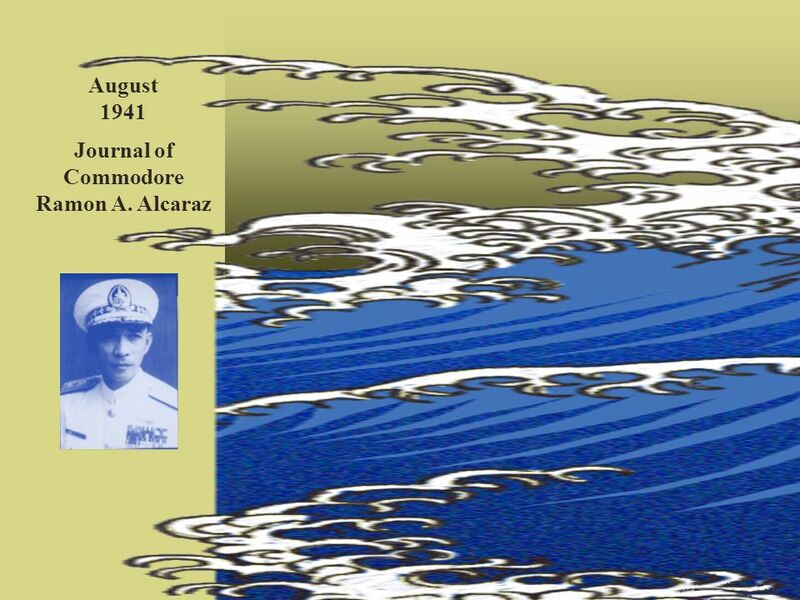 Journal of Commodore Ramon A. Alcaraz August 1941. 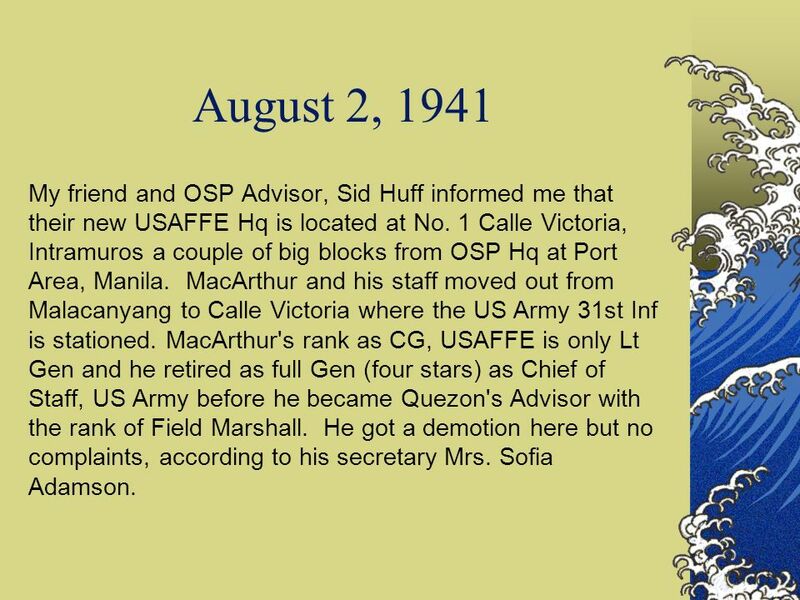 2 August 2, 1941 My friend and OSP Advisor, Sid Huff informed me that their new USAFFE Hq is located at No. 1 Calle Victoria, Intramuros a couple of big blocks from OSP Hq at Port Area, Manila. MacArthur and his staff moved out from Malacanyang to Calle Victoria where the US Army 31st Inf is stationed. MacArthur's rank as CG, USAFFE is only Lt Gen and he retired as full Gen (four stars) as Chief of Staff, US Army before he became Quezon's Advisor with the rank of Field Marshall. He got a demotion here but no complaints, according to his secretary Mrs. Sofia Adamson. 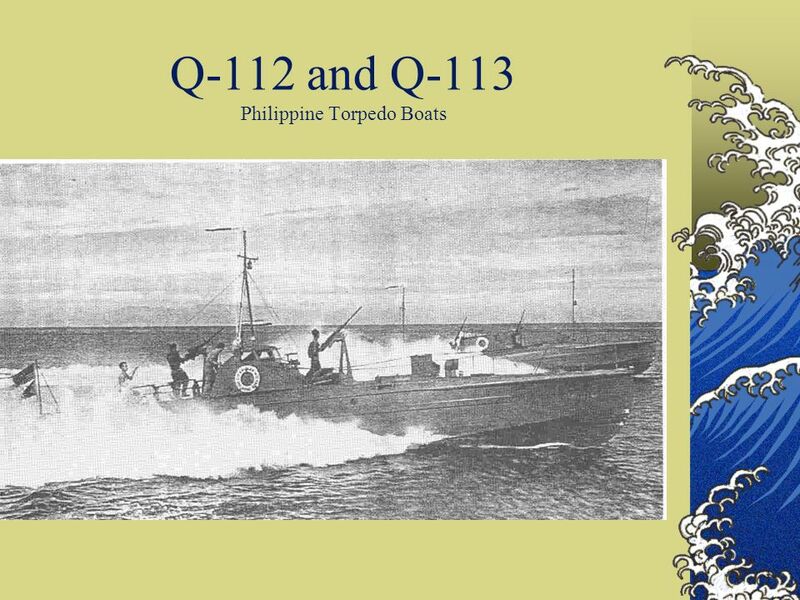 3 August 2, 1941 - continued Q-Boat RON ONE completed its extensive torpedo training at sea during rough weather and our next schedule will be sneak attacks using smoke screens. I am looking forward to this one as it seems very interesting, "sneak attacks." Manila News report that Joseph Broz alias Tito of Yugoslavia is emerging as the leader of the resistance against the Nazi. Tito is Communist. Pres. Roosevelt also announced that US Naval Forces landed on Iceland to prevent the Germans occupying the island. The Icelandic Govt invited the move which should assure US Munitions delivery to Britain. 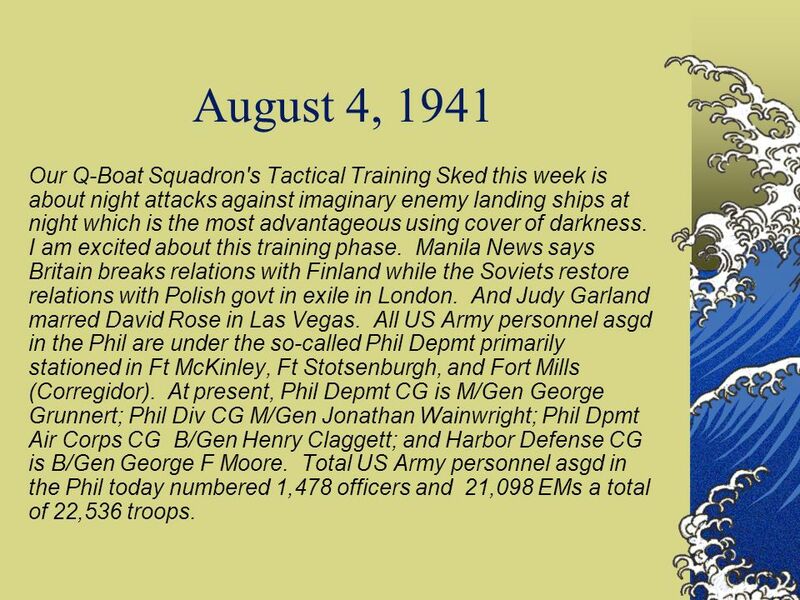 6 August 4, 1941 Our Q-Boat Squadron's Tactical Training Sked this week is about night attacks against imaginary enemy landing ships at night which is the most advantageous using cover of darkness. I am excited about this training phase. Manila News says Britain breaks relations with Finland while the Soviets restore relations with Polish govt in exile in London. And Judy Garland marred David Rose in Las Vegas. All US Army personnel asgd in the Phil are under the so-called Phil Depmt primarily stationed in Ft McKinley, Ft Stotsenburgh, and Fort Mills (Corregidor). At present, Phil Depmt CG is M/Gen George Grunnert; Phil Div CG M/Gen Jonathan Wainwright; Phil Dpmt Air Corps CG B/Gen Henry Claggett; and Harbor Defense CG is B/Gen George F Moore. Total US Army personnel asgd in the Phil today numbered 1,478 officers and 21,098 EMs a total of 22,536 troops. 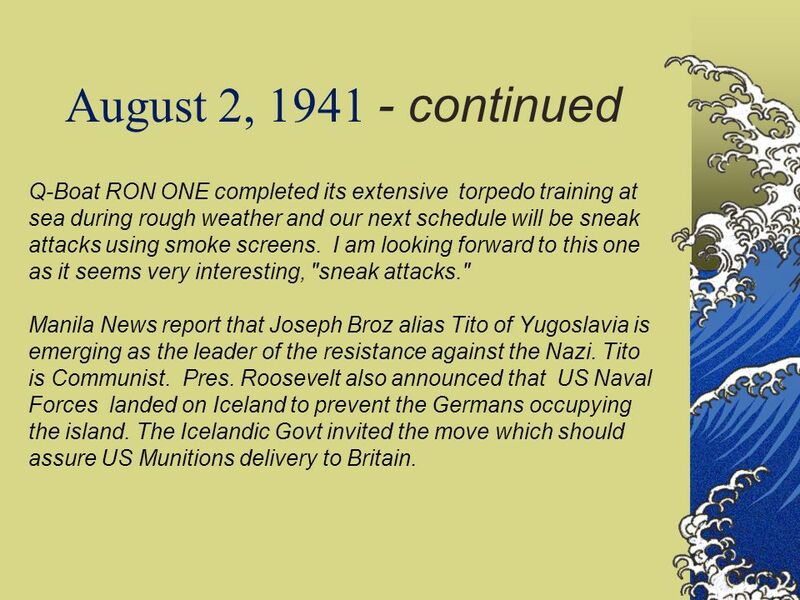 7 August 4, 1941 - continued Q-Boat RON ONE completed its extensive torpedo training at sea during rough weather and our next schedule will be sneak attacks using smoke screens. I am looking forward to this one as it seems very interesting, "sneak attacks." Manila News report that Joseph Broz alias Tito of Yugoslavia is emerging as the leader of the resistance against the Nazi. Tito is Communist. Pres. Roosevelt also announced that US Naval Forces landed on Iceland to prevent the Germans occupying the island. The Icelandic Govt invited the move which should assure US Munitions delivery to Britain. 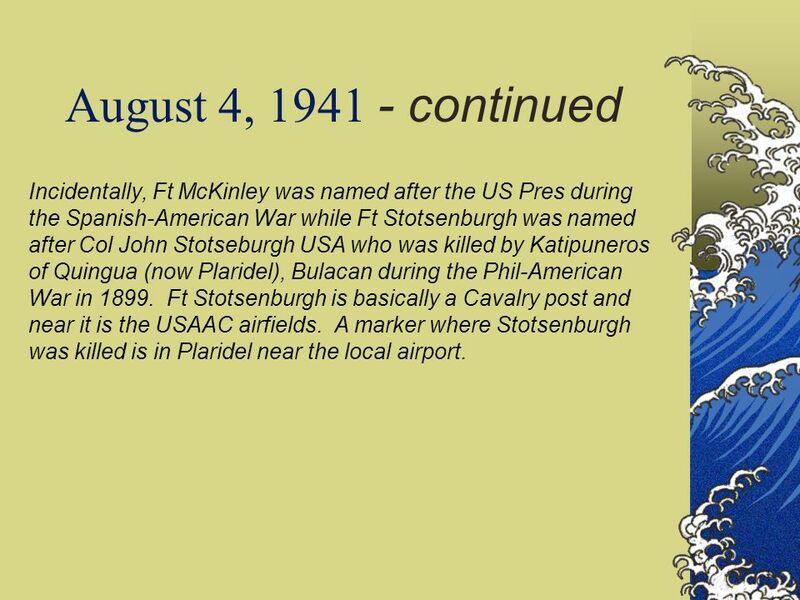 8 August 4, 1941 - continued Incidentally, Ft McKinley was named after the US Pres during the Spanish-American War while Ft Stotsenburgh was named after Col John Stotseburgh USA who was killed by Katipuneros of Quingua (now Plaridel), Bulacan during the Phil-American War in 1899. Ft Stotsenburgh is basically a Cavalry post and near it is the USAAC airfields. A marker where Stotsenburgh was killed is in Plaridel near the local airport. 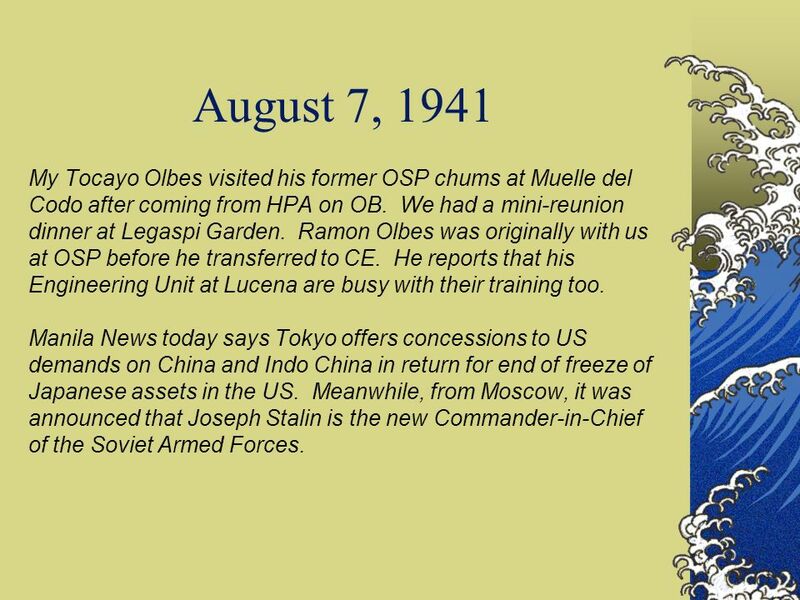 9 August 7, 1941 My Tocayo Olbes visited his former OSP chums at Muelle del Codo after coming from HPA on OB. We had a mini-reunion dinner at Legaspi Garden. Ramon Olbes was originally with us at OSP before he transferred to CE. He reports that his Engineering Unit at Lucena are busy with their training too. Manila News today says Tokyo offers concessions to US demands on China and Indo China in return for end of freeze of Japanese assets in the US. Meanwhile, from Moscow, it was announced that Joseph Stalin is the new Commander-in-Chief of the Soviet Armed Forces. 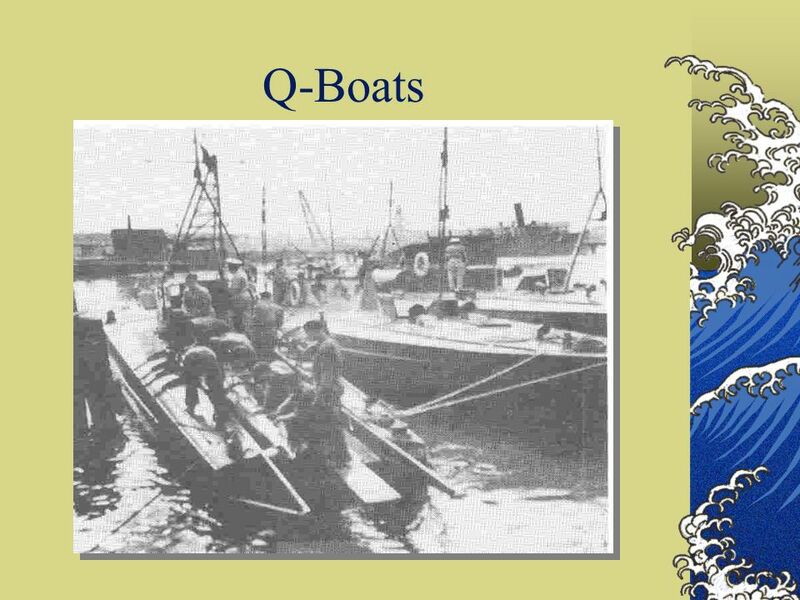 10 August 13, 1941 Our Q-Boats night attack exercises continue under different situations with greater intensity. My PAAC Mistah Aranzaso also reported that the 6th Pursuit Sqdn where he belongs are having intensive exercises at Zablan Field. My other classmates aside from Aranzaso in that Squadron under the command of 1st Lt Jess Villamor are Lts Bartolome Cabangbang, Urbano Caldoza, Horacio Farolan and Pete Aragon. I got the same report about intensive training exercises from my classmates in the Infantry at Camp Murphy and the Artillery at Camp Dau and Fort Wint since the USAFFE was announced last July 27. 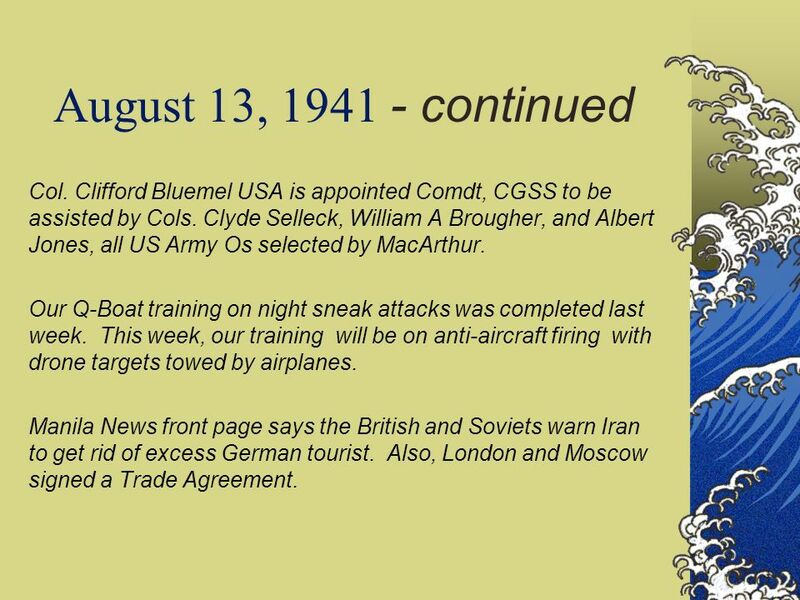 11 August 13, 1941 - continued Col. Clifford Bluemel USA is appointed Comdt, CGSS to be assisted by Cols. Clyde Selleck, William A Brougher, and Albert Jones, all US Army Os selected by MacArthur. Our Q-Boat training on night sneak attacks was completed last week. This week, our training will be on anti-aircraft firing with drone targets towed by airplanes. Manila News front page says the British and Soviets warn Iran to get rid of excess German tourist. Also, London and Moscow signed a Trade Agreement. 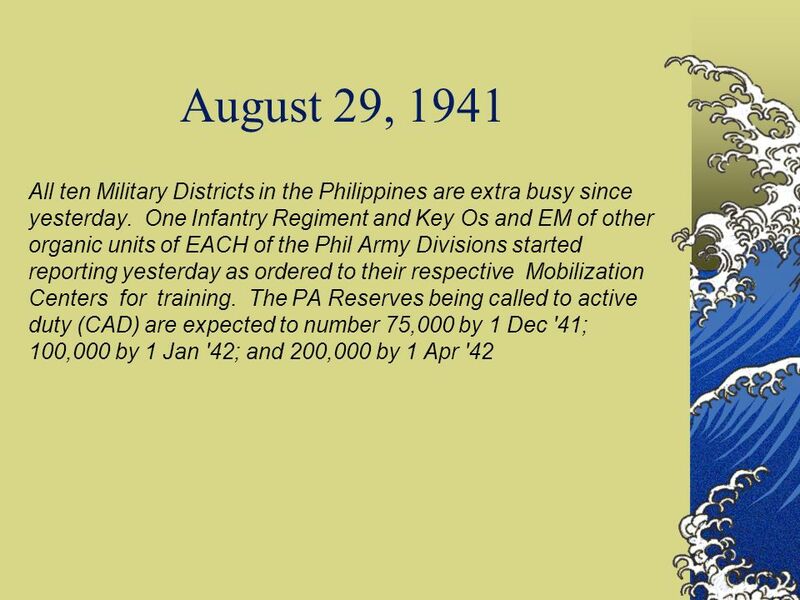 12 August 15, 1941 his is a significant day for our young 5-year old Phil Army. In consonance with Pres. 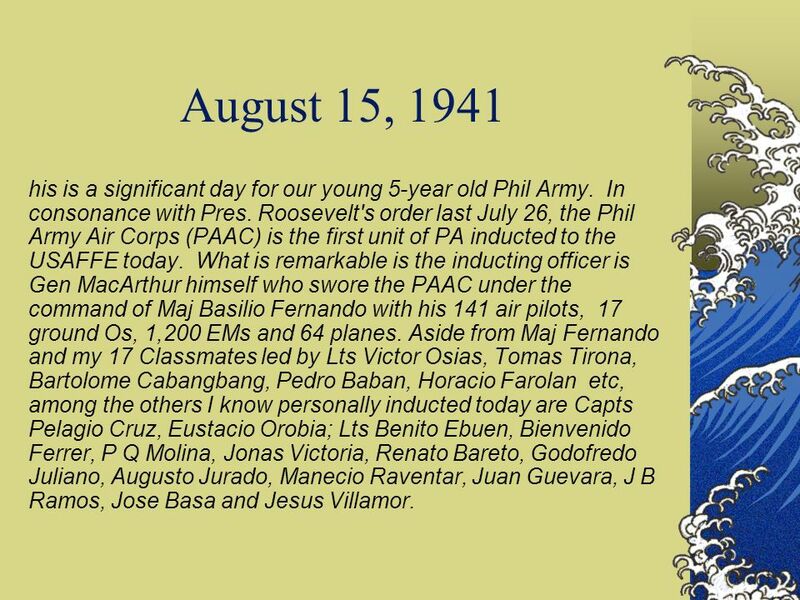 Roosevelt's order last July 26, the Phil Army Air Corps (PAAC) is the first unit of PA inducted to the USAFFE today. What is remarkable is the inducting officer is Gen MacArthur himself who swore the PAAC under the command of Maj Basilio Fernando with his 141 air pilots, 17 ground Os, 1,200 EMs and 64 planes. Aside from Maj Fernando and my 17 Classmates led by Lts Victor Osias, Tomas Tirona, Bartolome Cabangbang, Pedro Baban, Horacio Farolan etc, among the others I know personally inducted today are Capts Pelagio Cruz, Eustacio Orobia; Lts Benito Ebuen, Bienvenido Ferrer, P Q Molina, Jonas Victoria, Renato Bareto, Godofredo Juliano, Augusto Jurado, Manecio Raventar, Juan Guevara, J B Ramos, Jose Basa and Jesus Villamor. 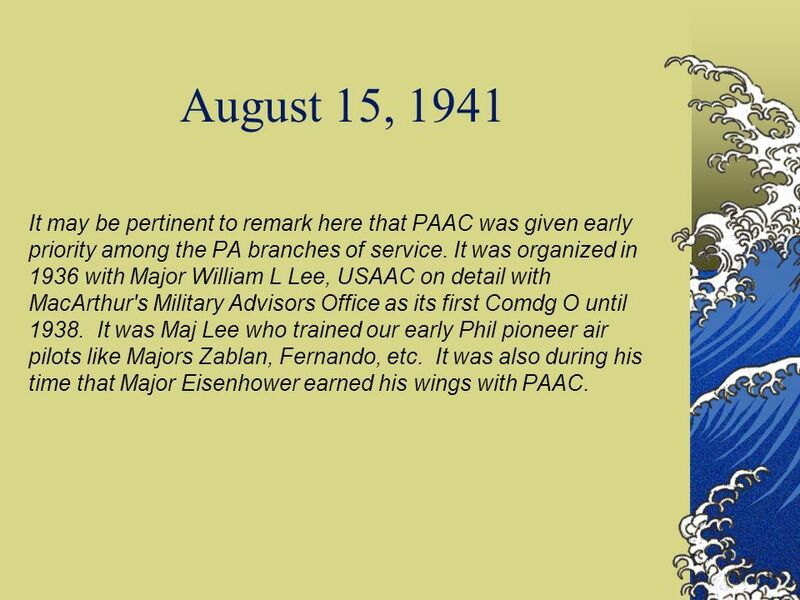 13 August 15, 1941 It may be pertinent to remark here that PAAC was given early priority among the PA branches of service. 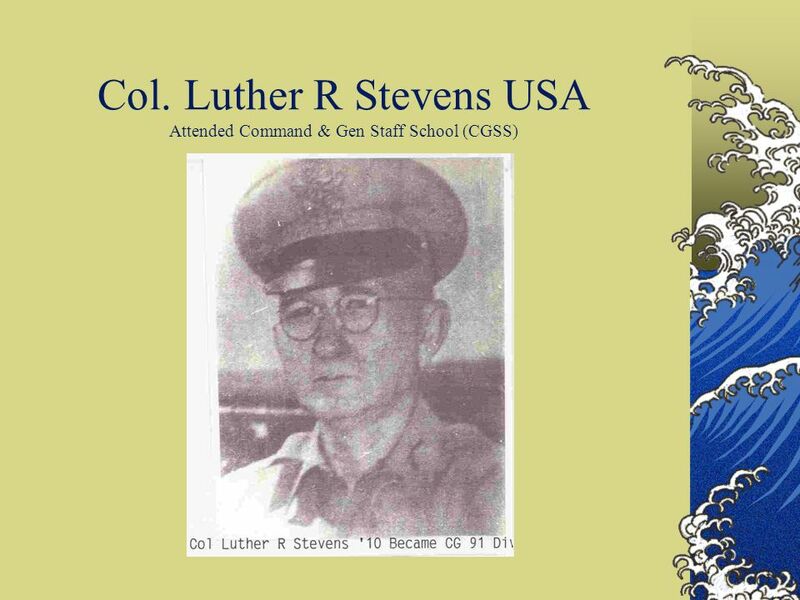 It was organized in 1936 with Major William L Lee, USAAC on detail with MacArthur's Military Advisors Office as its first Comdg O until 1938. It was Maj Lee who trained our early Phil pioneer air pilots like Majors Zablan, Fernando, etc. It was also during his time that Major Eisenhower earned his wings with PAAC. 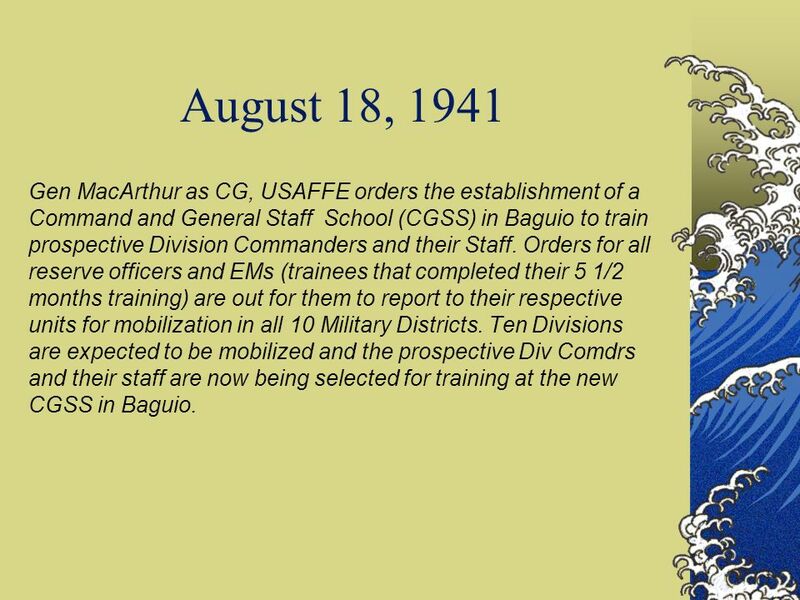 14 August 18, 1941 Gen MacArthur as CG, USAFFE orders the establishment of a Command and General Staff School (CGSS) in Baguio to train prospective Division Commanders and their Staff. Orders for all reserve officers and EMs (trainees that completed their 5 1/2 months training) are out for them to report to their respective units for mobilization in all 10 Military Districts. Ten Divisions are expected to be mobilized and the prospective Div Comdrs and their staff are now being selected for training at the new CGSS in Baguio. 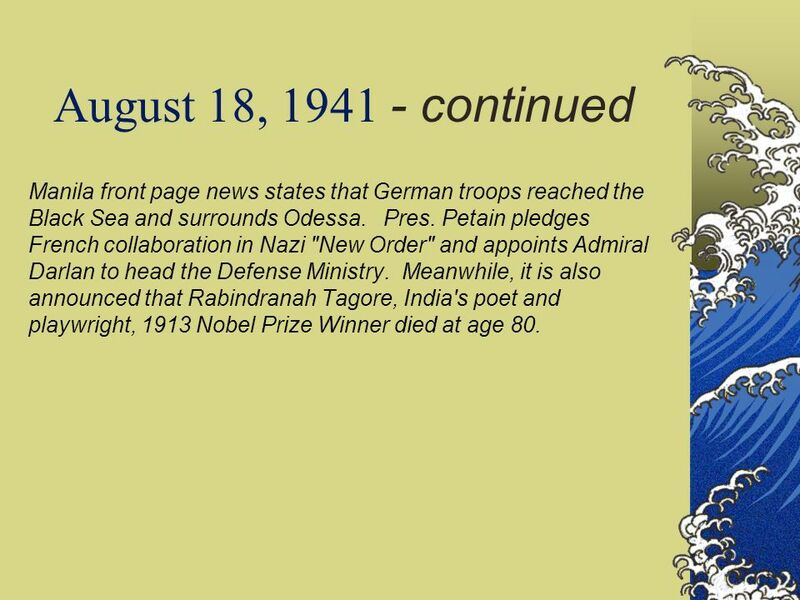 15 August 18, 1941 - continued Manila front page news states that German troops reached the Black Sea and surrounds Odessa. Pres. Petain pledges French collaboration in Nazi "New Order" and appoints Admiral Darlan to head the Defense Ministry. Meanwhile, it is also announced that Rabindranah Tagore, India's poet and playwright, 1913 Nobel Prize Winner died at age 80. 16 August 21, 1941 Our Q-Boat tactical training, AA firing drone targets towed by airplanes is going on as scheduled. All hands (Os & EMs) are required to man the 40 Cal AA guns and fire like when we were at PMA during rifle markmanships. OSP policy is all hands are supposed to be capable of being AA gun crew members. AA exercises will last during the week followed by depth charge firing next week. 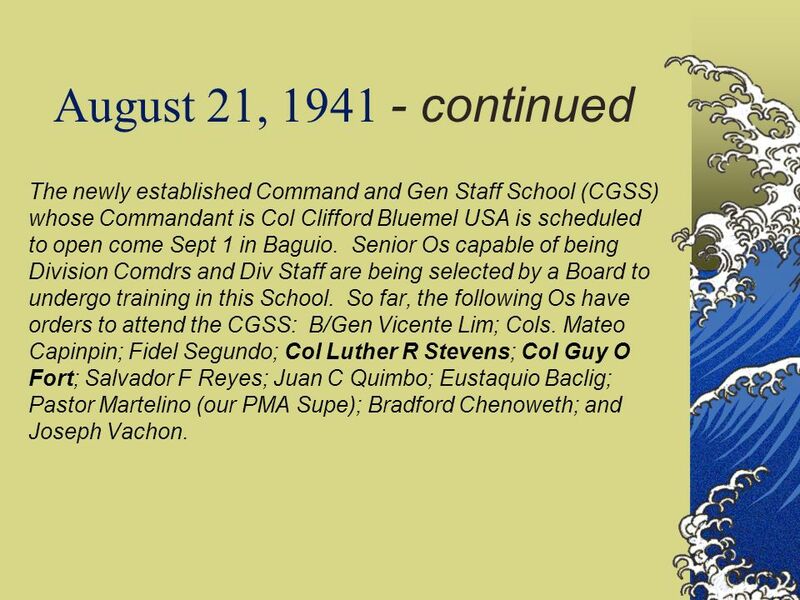 17 August 21, 1941 - continued The newly established Command and Gen Staff School (CGSS) whose Commandant is Col Clifford Bluemel USA is scheduled to open come Sept 1 in Baguio. Senior Os capable of being Division Comdrs and Div Staff are being selected by a Board to undergo training in this School. So far, the following Os have orders to attend the CGSS: B/Gen Vicente Lim; Cols. Mateo Capinpin; Fidel Segundo; Col Luther R Stevens; Col Guy O Fort; Salvador F Reyes; Juan C Quimbo; Eustaquio Baclig; Pastor Martelino (our PMA Supe); Bradford Chenoweth; and Joseph Vachon. 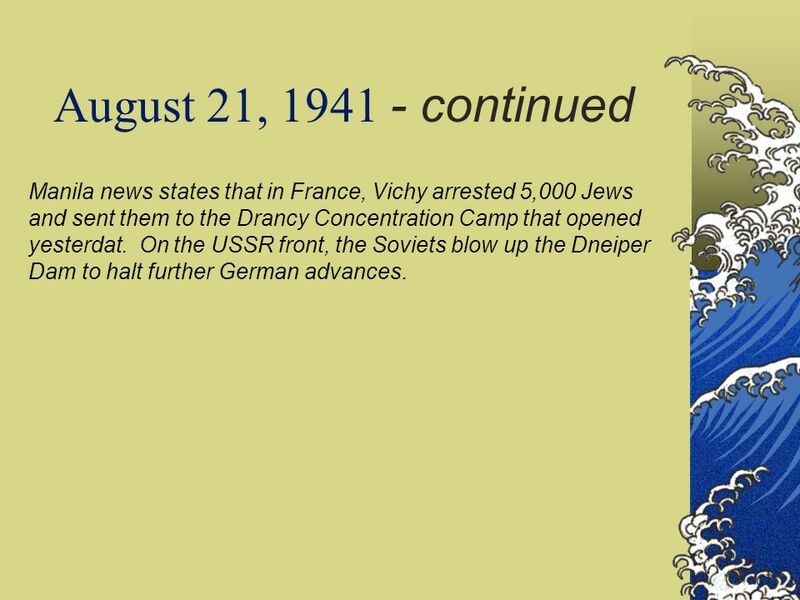 20 August 21, 1941 - continued Manila news states that in France, Vichy arrested 5,000 Jews and sent them to the Drancy Concentration Camp that opened yesterdat. On the USSR front, the Soviets blow up the Dneiper Dam to halt further German advances. 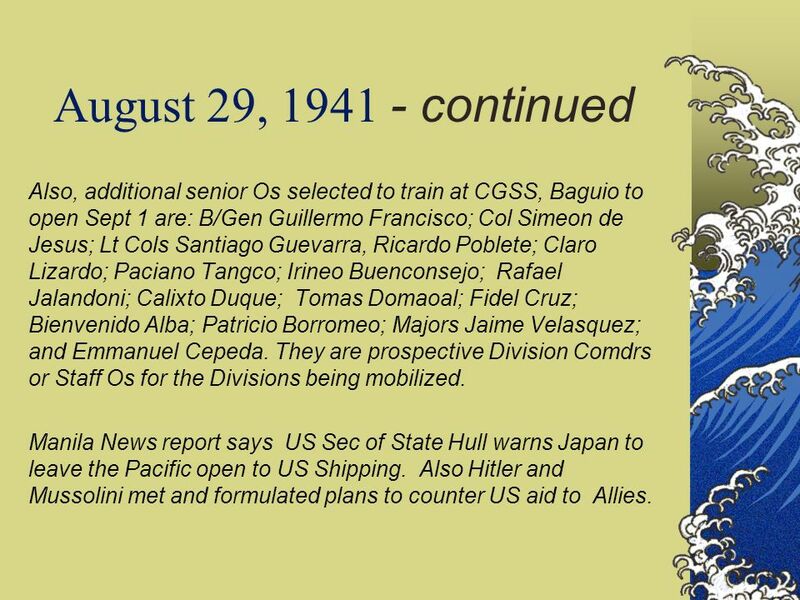 22 August 29, 1941 - continued Also, additional senior Os selected to train at CGSS, Baguio to open Sept 1 are: B/Gen Guillermo Francisco; Col Simeon de Jesus; Lt Cols Santiago Guevarra, Ricardo Poblete; Claro Lizardo; Paciano Tangco; Irineo Buenconsejo; Rafael Jalandoni; Calixto Duque; Tomas Domaoal; Fidel Cruz; Bienvenido Alba; Patricio Borromeo; Majors Jaime Velasquez; and Emmanuel Cepeda. They are prospective Division Comdrs or Staff Os for the Divisions being mobilized. Manila News report says US Sec of State Hull warns Japan to leave the Pacific open to US Shipping. Also Hitler and Mussolini met and formulated plans to counter US aid to Allies. 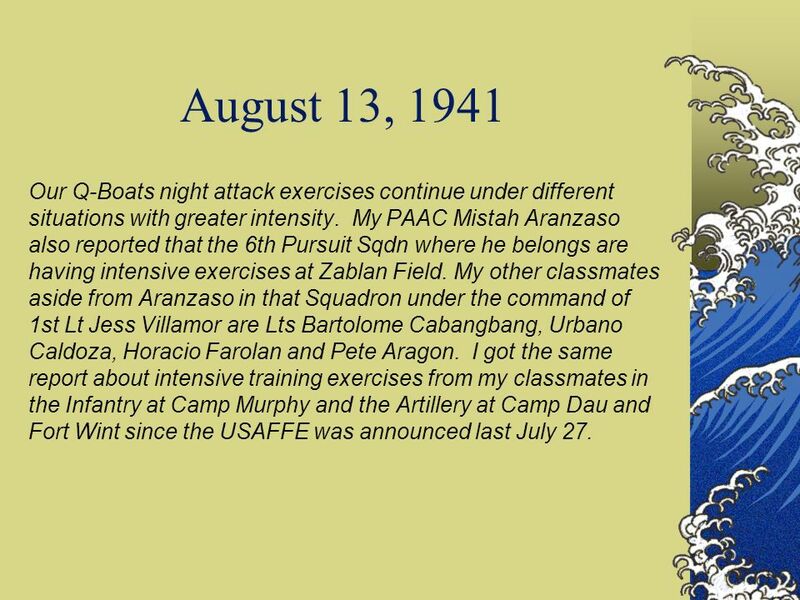 Download ppt "Journal of Commodore Ramon A. Alcaraz August 1941." World War II Begins Lesson 4 Sherry Woods, Caywood Elementary School Lexington, TN. Journal of Commodore Ramon A. Alcaraz September 1941. 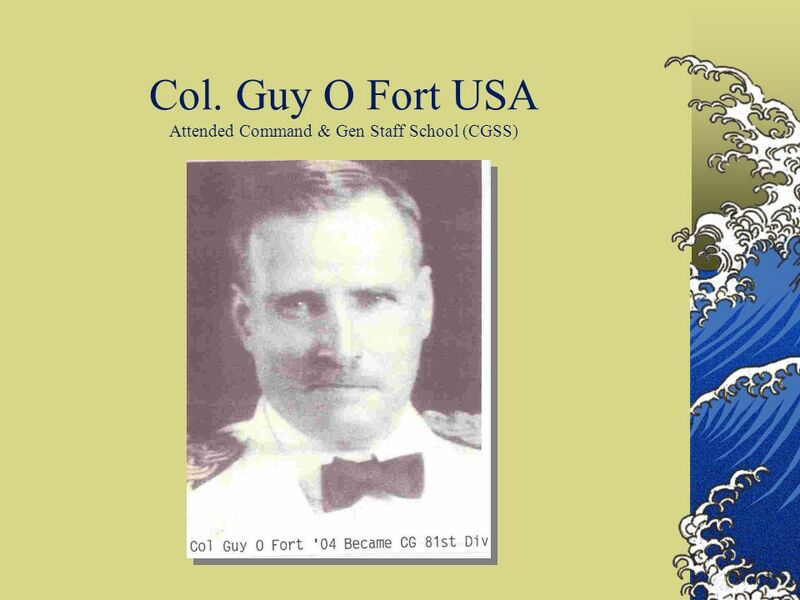 World War II Semester 2 – Day 156. The Global Conflict Section 2: The Axis Advances Ms. Garratt. D-Day. Planning Soviets had done most fighting in Euro. Stalin wanted a U.S. and G.B. attack – Churchill nervous – Couldn’t cross Channel because of U-Boats. H ITLER ’ S L IGHTNING W AR. P OLAND Hitler set his sights on Poland Signed Nonaggression Pact with Stalin Why? Secret part: Germany and Soviet Union.